I'm working with a client at the moment who is making various changes throughout her entire house. 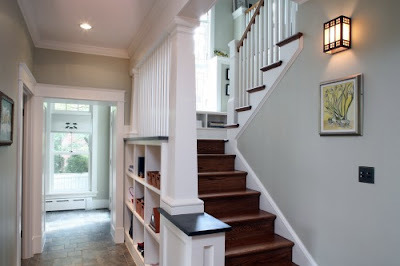 Although many of the changes are small, they are happening in lots of different areas and will have a huge impact on the overall look and feel of her home. We are now working on lighting which leads me to today's post (I know you were wondering if I would get to it) - Stairwells. My client has two in her home - one from her lower level garage up to the main living space and another that leads to an upstairs hangout/playroom. At the moment, both are a bit dark and narrow. 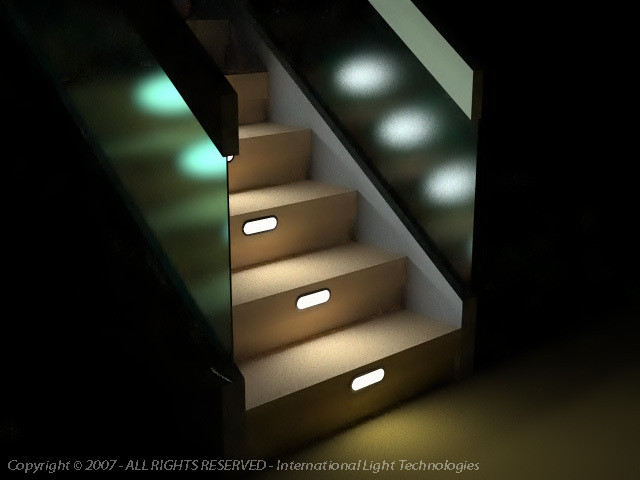 There are a number of options for lighting a stairwell. Here are my top picks and when to consider them. Hands down, this is my favorite type of stairwell lighting. 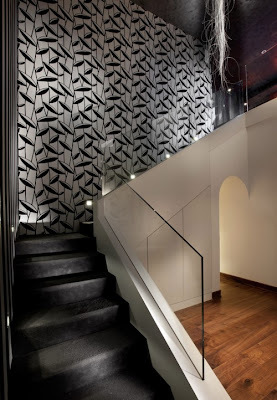 It gives the stairwell a "WOW" factor like no other (and I am all about that). 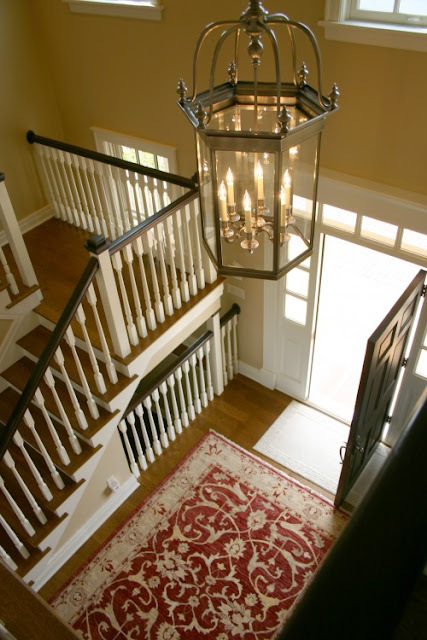 By placing a large lantern or chandelier in the well of a staircase, you can create a major focal point. 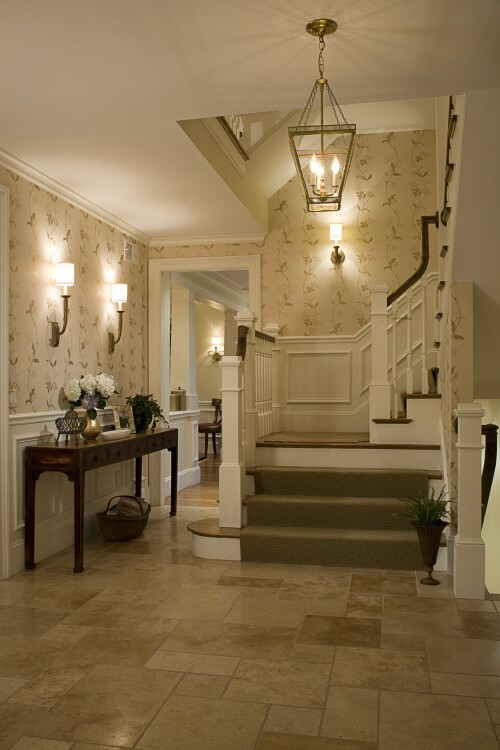 This type of lighting works best in larger stairwells that are open to foyers or landings. The styles vary tremendously, so you are sure to find something appropriate for your space. Biggest down side - changing the light bulbs in a fixture like this! This appears to be a home with three levels so this clever homeowner has selected three fixtures and placed them at different levels to create lighting for each floor of the home. These are the smartest way to add lighting and interest to a hallway. They are versatile and work in most stairwells. Wall sconces come in single, double and even triple lights. 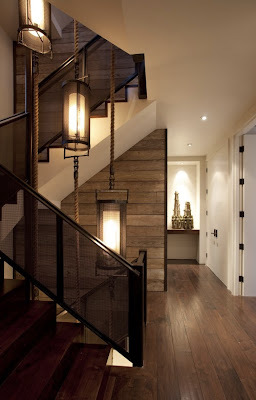 If you don't want the look of multiple fixtures in a stairwell, then opt for a pair of double light sconces like these. 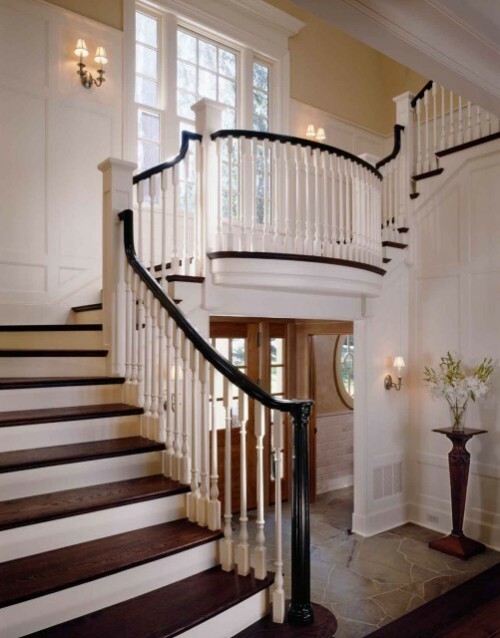 Beautiful staircase BTW! This space is really a perfect example of how wonderful it looks to vary the lighting in a home. 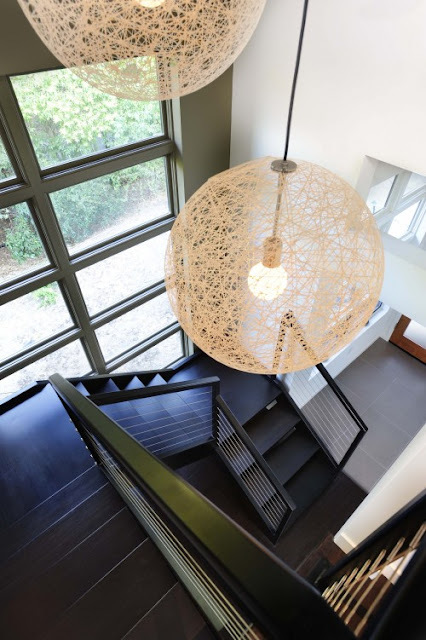 The lantern is really located in the foyer, but since the stairwell is so open it works with the single wall sconce on the upper landing. One very important thing to consider with wall sconces is the profile of the fixture. There are many beautiful sconces now available online, but you simply cannot appreciate the scale from a picture on the computer. 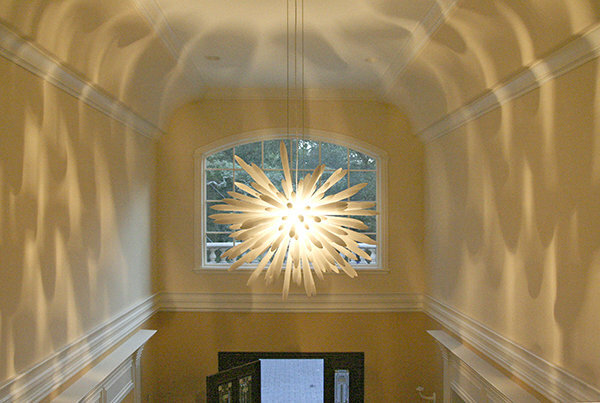 It is very important to read the specs of the fixture to ensure it is going to work in your space. 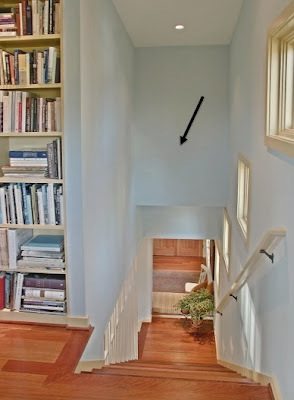 For example, the below stairwell is narrow. The fact that one side is open does trick your eye into thinking it's larger. But, you would not want a wall sconce that juts out into the walking area. So, in this case the homeowner has selected low profile fixtures and has placed them higher on the wall. 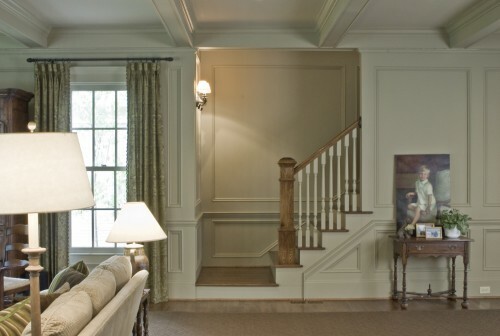 In this example, there is a double wall sconce in a simple mission style. It is not a focal point, but rather a practical solution for lighting. The focus is on the artwork below the fixture. Another example of a simple single wall sconce. 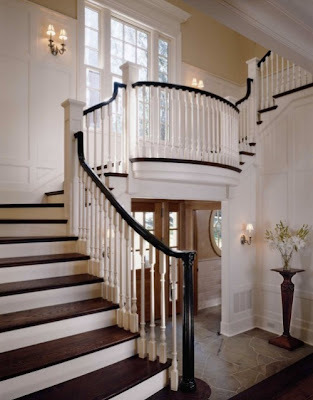 With a staircase this pretty, you do not want people focusing on the sconce! I love the look of this wall. It is very hard to see, but there is one small wall sconce between the two groupings of pictures in the stairwell area. 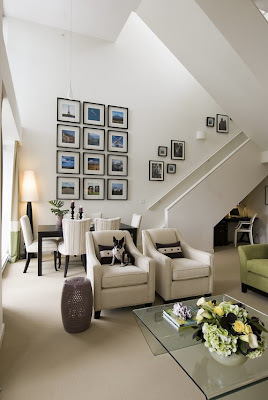 Obviously, the homeowner has selected a very simple understated fixture so the focus can be on the fantastic photographs. This will give you ample light in a clean and simple way. The idea here is not to draw attention to the fixture. 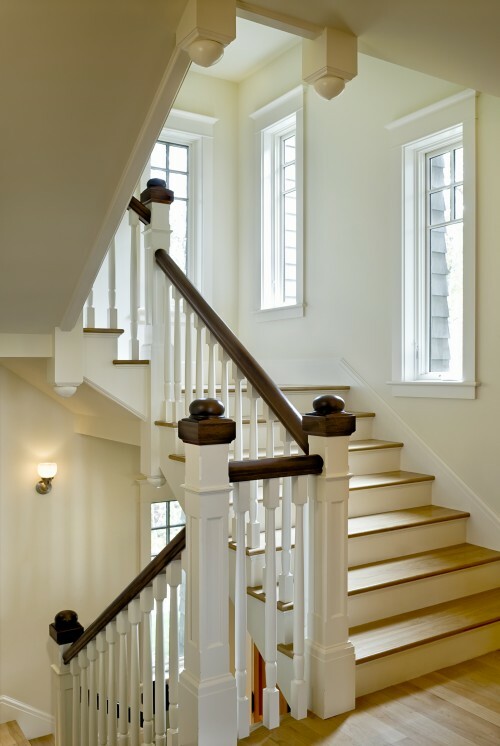 These can be used anywhere, but really work best in dark, steep, or narrow hallways where wall sconces would not be possible due to the width of the stairwell. For those of you scratching your head on what I am talking about. 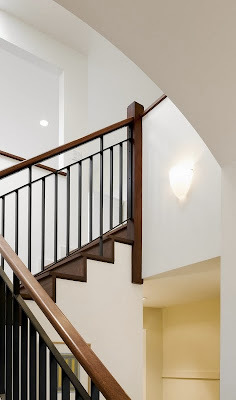 Back lighting would be any wall mounted fixture above the entry points into stairwell. This picture illustrates where the back light would be place (if this stairwell had one). 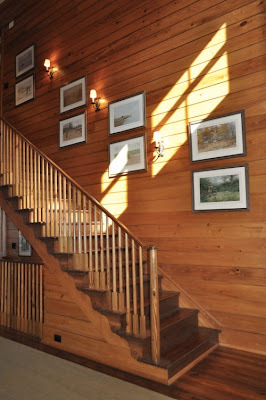 The benefit to this type of lighting - there are no fixtures running the length of the stairwell, so you have a canvas to display groupings of photographs or other special artwork. It's also relatively easy to change the light bulbs in this type of fixture. Although this fixture is technically a wall sconce, it's being used as back lighting. Just beautiful and a perfect match for the style of this home. This works great in modern spaces and for areas, that you would like to maintain low lighting overall but want to ensure people can easily navigate the steps. Applications would include stairs entering a home theater area, a lounge space or any teenager's dream bedroom. 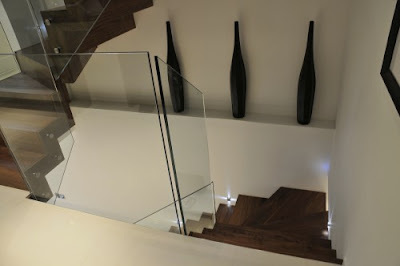 These can be mounted on the wall or even the riser of the step depending on the space you have available. So, now you have no excuse for a dark depressing staircase! PS: Your homeowner's insurance company will thank me too. M.
Great post! 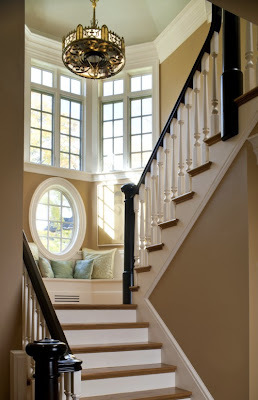 I love the first lantern too, its the ideal way to dress up an stairwell and is so elegant and timeless. 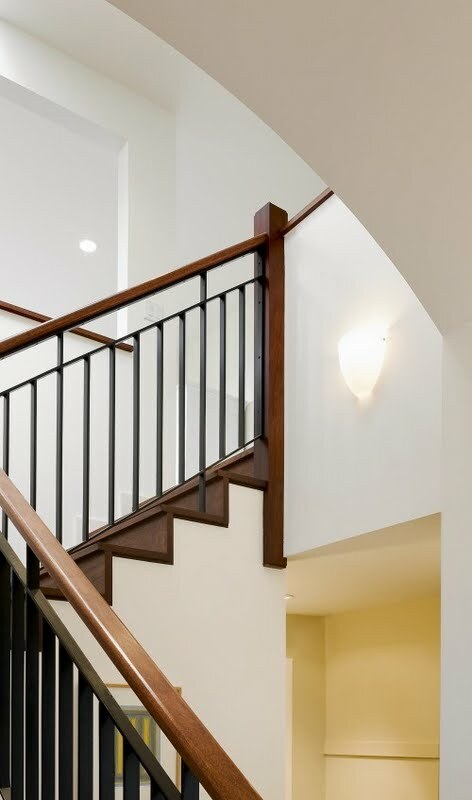 I like a two light sconce for stairwells unless its very narrow, a single arm sconce can look skimpy in my humble opinion. This post gives you a lot to think about and I am going to bookmark it as we are in the throes of figuring out a lot of lighting ourselves and this post is a great reference. 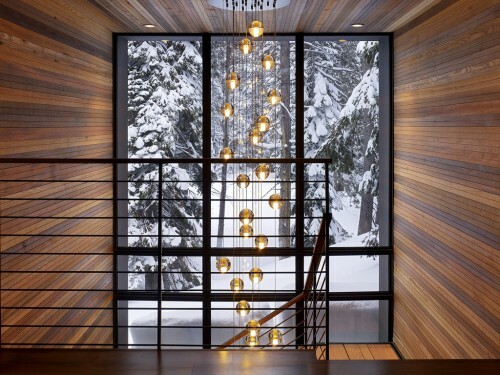 What a wonderful guide to stairwell lighting. Good post! 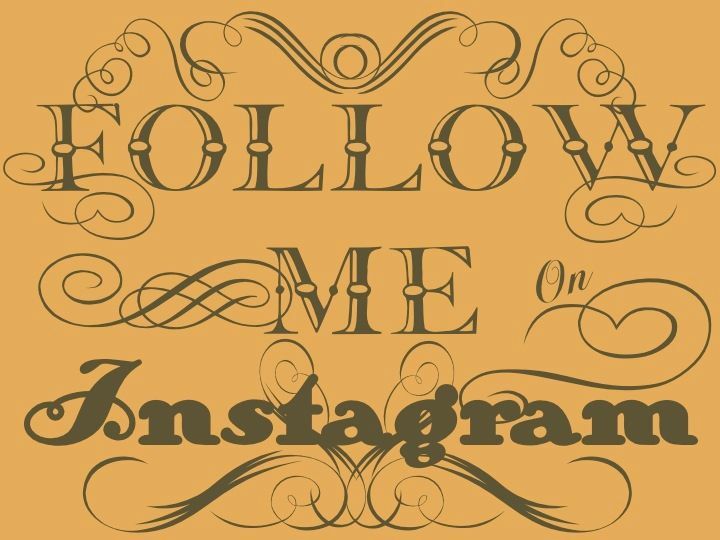 I've been searching in google for some items and fortuitously found this interiordesignmusings.blogspot.com website. Thank you for taking the time to discuss this, it's a useful info and I like learning more on this. If possible, would you mind updating your blog with more information? It is quite helpful for me.